After month of waiting, Apple Music subscribers who are also invested in the Sonos speaker ecosystem will finally get native access to Apple's streaming music service on Wednesday, a report said Tuesday. Sonos confirmed tomorrow's Apple Music launch to Re/code, saying integration with its lineup of connected speakers is scheduled to go live at 9 a.m. Eastern. The announced the launch in a subsequent blog post. The development comes nearly two months after Sonos launched an Apple Music beta test program in mid-December. "The feedback from Apple Music members on Sonos during the beta period has been great," said Eddy Cue, Apple SVP of Internet Software and Services Eddy Cue. "Sonos plus Apple Music provides an amazing listening experience at home - and we're excited to offer it to all Sonos customers starting tomorrow." Using the Sonos Controller app for iPhone, iPad and iPod touch, as well as Mac, PC and Android phones, Sonos owners will be able to stream Apple Music to multiple speakers within their home or office. Supported Apple Music features include For You, New, Radio and My Music, as well as streaming access to the entire Apple Music catalog. 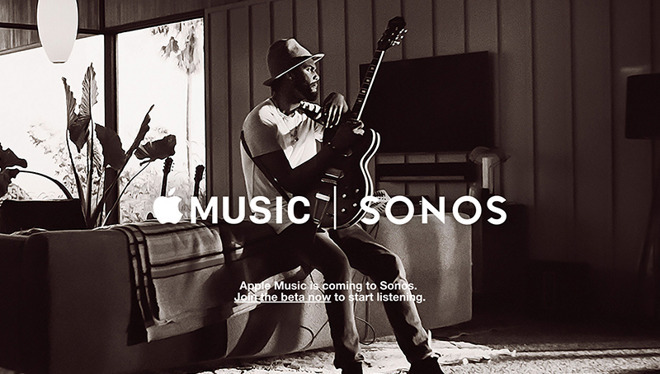 Apple Music is the latest to join Sonos' list of streaming music partners. The company has long offered software support for industry heavyweights like Pandora and Spotify, while at the same time picking up smaller services like Tidal, Google Play, Deezer and many more. Apple Music integration, however, has been waiting in the wings for well over half a year. Sonos first announced plans to build in support for Apple Music in November. At the time, Apple SVP of Internet Software and Services Eddy Cue touted Sonos hardware, saying time to integration was actually quite fast considering the two companies' high standards. Along with broader hardware support for current Apple Music subscribers, the Sonos partnership could be a valuable driver of growth for Apple's fledgling streaming service. "Well over 90 percent of the music people listen to on Sonos speakers is from streaming services," Sonos CEO John MacFarlane told BuzzFeed News in an interview last year. "We think Apple Music is going to be a catalyst that will raise that percentage even higher. What we've found is that as Sonos owners discover streaming services like Apple Music they use the local collections they have on their home computers and cell phones less and less."